Testing of the firms AML program must be performed at least annually (on a calendar year basis). Qualifications of the independent third party tester must insure they have a working knowledge of applicable requirements under BSA and its implementing regulations. 1. 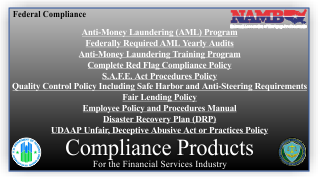 Evaluation of the firms overall integrity and effectiveness of their AML compliance program. 6. Evaluation of the firms staff training procedures. 7. Evaluation of the firms response to previously identified deficiencies, if any. In order to make the process as painless as possible, all we require on your part is a 15-30 minute phone call with you to complete the interview/certification process. Let us know your preferred contact person and date and time most convenient for you and we will try to accommodate your preference. Book your audit early! Time slots will fill up fast. ORDER and Schedule Your Company's Audit NOW!